Bainbridge - the UK's only marine, sail making, cover making and watercraft distributor, has added Morbern Europe to its extensive range of Marine fabrics. Morbern's marine and recreational vinyl fabrics have been designed to be hard wearing in daily use whilst blending modern colour, profile and touch, which ensures that their latest ranges perfectly balance functionality with style. This range marks an expansion for Bainbridge which rounds out its offer to Cover Makers and Marine Upholsterers by bringing a specially selected, two range, offer. This is available from stock at Bainbridge in Hedge End and can be supplied as full roll or cut length. Other styles within the Morbern range are also offered to special order. The exclusive MGX MorGuard Xtreme stain resistant and cleanable coating protects its designs against staining and dirt build up which enhances product life and reduces the need for strong cleaning agents. This unique coating makes Morbern the perfect choice for both interior and exterior protection. "We are inspired by the opportunities that Morbern Europe brings to Bainbridge"
said Gavin Lacey, Commercial Director for Bainbridge. 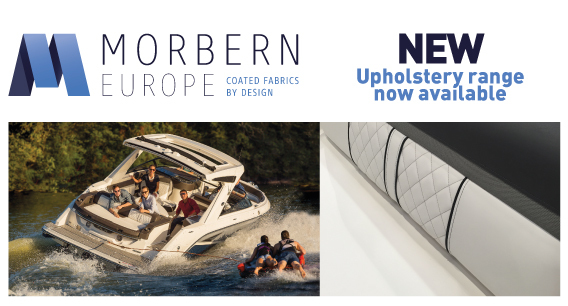 "Morbern Europe's commitment from upholsterers to boat builders is evident by their active pace and continued drive to support them with leading technical fabrics." "We are delighted to be partnering up with Bainbridge in the UK"
said Carine Equeter, Sales & Marketing Director for Morbern Europe. "Our wide range of marine coated fabrics fits in well with the Bainbridge high performance product offering. Their e-shop, trade counter and dedicated sales team are real assets for manufacturers such as Morbern, looking to grow their brand and market share in the UK and beyond."